The Northwood Glass company was founded by Englishman Harry Northwood, the son of a talented glass manufacturer. In 1880, when he was just twenty years old, harry left England to work in America. In 1887 he founded his own factory in Ohio before eventually moving it to Wheeling, West Virginia. It is a widely held belief that Harry Northwood was responsible for bringing the production technique for iridiscent glass to America, having seen it done at his father’s glassworks in england. By 1908 Harry was producing a range of iridiscent glass, using moulds from earlier pressed glass and for roughly ten years the Northwood glass company was at the forefront of the carnival glass industry. He began by making a range of marigold carnival glass, which he called Golden Iris. Iris for the Greek word meaning rainbow. Harry thought that this was a good name for a glass which seemed to contain and reflect so many colours. The Northwood factory proved to be highly productive, introducing designs such as grape and cable, fine cut and rose, beaded cable, wild rose, singing birds, peacock at the fountain, leaf and beads, nippon and rosette. 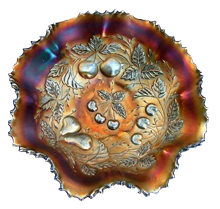 Of all its designs, grape and cable was the most popular, and at one time could be obtained in over seventy different shapes of dishes, vases, plates and bowls. Many competitors, noted the popularity of the northwood designs and copied them, this being quite a common practice at the time. Northwood Glass also introduced some beautiful pastel carnival glass, that came in delicate shades of ice blue, ice green and white. Today, the pastels are highly sought after but are quite rare. White is perhaps the easiest to find and is very pretty with a delicate pearly sheen. In 1915, a range of Northwood iridised custard glass appeared. This opaque and cream coloured glass has a pastel iridescent overlay, and is now very rare, and commands high prices. In 1918, Harry Northwood contracted a fatal disease and died. Without him the Northwood Glass company seemed to lose direction and finally foundered in 1925. In 1896 Harry Northwood together with Samuel Dugan and his three sons (Thomas E.A., Alfred and Samuel Jr.), took over the company, and changed its name to Northwood. When Harry left, the name was changed to Dugan and in 1910 the company began to produce carnival glass often using old Northwood Glass moulds. Normally it marked its pieces with a ‘D set inside a diamond shape‘, which is possibly why in 1913 it changed its name to the Diamond Glass Company. Based in Indiana Pennsylvania, Dugan was responsible for many wonderful pieces of iridescent glass with opalescent edges. The company used patterns such as fan, cherry, apple blossom twigs, butterfly and tulip, farmyard, fishnet, starfish stippled, pastel swans, raindrops and heavy grape. The Dugan company continued in production until 1931, when the factory was destroyed by a disastrous fire. Most Carnival Glass is unmarked, but the Northwood Glass Company regularly marked their products with an (N) inside a circle. 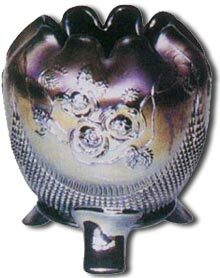 This makes northwood glass relatively easy to identify even by novice glass collectors.